Har Adar, my home town, suffered a terror attack two weeks ago today. Plenty of pundits have put in their two cents since the terror attack in my community, Har Adar, on September 26. Las Vegas overshadows us all, but in our community, we’re still dealing with the aftermath of that awful Tuesday morning. Confident commentators are sure they know why a terrorist opened fire at the gate of our community, who precisely is to blame, and precisely what steps to take. And what I lay before you here also has its whys and whats. But in the spirit of the season, it looks both inward as we do on Yom Kippur, and outward, as the Feast of Tabernacles teaches us. “Are you alright?” The text messages started beeping in at 7:45 a.m. on September 26. I was on my second cup of coffee and had already sat down at my desk. About 30 minutes earlier, I heard the sirens. One siren. I guess someone had a heart attack. Two. That’s strange. Three. I opened my news websites. 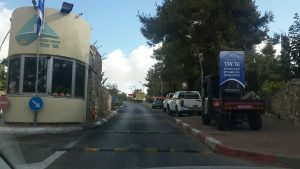 The first reports said three Israelis had been shot and killed by a terrorist on the patrol road at Har Adar. That makes sense in my world. There are plenty of guns aimed at us all the time. If it’s on the patrol road, I told myself that morning as the news broke, the “Israelis” (the euphemism for security personnel before the authorities allow any more information to be released) are soldiers, and a terrorist must have opened fire on a patrol vehicle. I’m fine, I text back. This yellow gate slides open to admit Palestinian workers to Har Adar. It’s been closed since the Sept. 26 attack. Behind it is the Palestinian village of Bidu. Then the news came into focus. At the gate of Har Adar. More text messages. A terror attack at the gate? I began to think in terms of our front gate, and civilians. West of that gate, in the wadi on the other side of the security fence is the village of Qatana in Palestinian territory we had learned to fear. When our girls were younger, when we’d drive up the main road from the entrance toward home, which parallels the forest, the wadi and the road down to Qatana, we’d follow protocol to be able to escape the car in case an incendiary device was thrown at it. Time to undo your seatbelts girls, we’d call out with false cheer. Why? They’d ask. Well, we’re almost home, we’d say. The entrance to Har Adar. On the right, is a banner dedicated to the three men who lost their lives protecting the community. On the window ledge of the guard post are three potted plants each marked with the name of one of the dead. 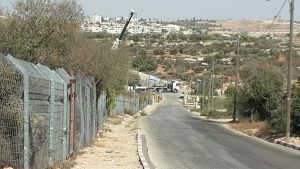 Next I heard, it’s not the entrance gate, it’s the big yellow gate where Har Adar ends and the Palestinian Authority begins, down the street from our sports center, elementary school and library, where the Palestinian workers come and go every day. On a weekday I see their cars parked on the Palestinian side of the barrier. They come in on foot. The gate is locked and no one’s ever there whenever I pass it on my walks around the community. Our community security coordinator, Amit Steinhart, was seriously injured. Our community bulletin board looked surreal to me. At left, a row of the three death notices, one for each guard. The turquoise sign next to them announces prayer times for Yom Kippur, amid various and sundry other community notices like houses for rent and a macrobiotic sukkah. Later, on his release from the hospital, Steinhart told the media that Or Arish’s last words were “Amit, I saved you.” Meaning that Amit could now do what was needed to save others. And with our schoolchildren streaming into their classrooms at that very hour, only 200 yards up the road, that meant everything. 8:30 a.m.: I phoned Abed. I don’t know his last name. I can’t remember where he lives. Bidu, I think, northeast of us. That’s where the men came from who built our home 30 years ago. (The murderer came from Beit Suriq, farther along the ridge east of Bidu.) Old Abu Ghazi, who was in charge of the laborers who built our home, was from Bidu. When construction was done, he came with his whole family with gifts for us. A bucket of apricots from his trees. Toys for the girls. He brought a grapevine from his own vineyard and planted it in our garden. It gives us tiny, sweet, green grapes every summer. As for Abed, he planted the rose bushes in my garden 25 years ago. He’s been working at somebody’s house right down the street from us so I’ve seen him every day recently. He has a tractor with a Palestinian Authority license plate. When he first got the tractor, when it was shiny and new, 25 years ago, I saw it had a Palestinian Authority license plate and I thought, that’s a good sign, the Palestinian Authority has license plates. Over the years after the rose bushes, he’d greet me with shalom Miriam, what’s up, and I’d say shalom. But by then I had forgotten his first name too. I’m not sure why I phoned Abed on the morning of the attack. Maybe because when I went outside to see if I could figure out where the sirens were coming from, and to watch the helicopters hovering, I saw Abed drive up the street in his tractor, as usual. Passing him in the opposite direction, from the end of our cul-de-sac, without a second glance, were two security officers of some kind, on motorcycles. I saw a contingent of four heavily armed Border Police officers, three young men and a woman, going from house to house. One of them, a young woman, asked me gruffly: Everything OK? Yes, everything’s OK, I responded. Why are you going from house to house, I asked, is there a terrorist loose? No, we’re just making sure you’re OK, they answered. Oh yes, I’m fine. Thank you for your service, please accept my condolences, I said. Their faces were impassive, as if I hadn’t spoken. Abed wasn’t down at the house where he’d been working. But he picked up my call. Abed, what’s up? Hakor beseder, everything’s OK, Miriam, what’s up with you, he responded, automatically. I ask him: Where are you? I saw you driving up the street. He answers, I was there but then I left. They’ve got us up here together, by the offices, he said. I’m sorry, I said to him. And in my mind, I enumerated my reasons for being sorry. Sorry for the three of our own killed, and our security officer seriously injured. Sorry that I wondered for a second whether you had done it, Abed. Sorry for living in a place where such a thing could happen. Sorry for living in a world where some version of this now happens all the time. 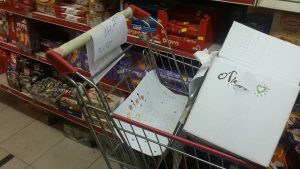 A shopping basket at our minimarket with a sign saying “Place your goodies for the soldiers, and kids letters and drawings here. The top drawing, in the heart, wishes a speedy recovery to Amit, our security chief. Four days later, Erev Yom Kippur. Before Kol Nidre services began I was sitting in the vestibule of the Har Adar synagogue, talking to my brother Paul, who also lives in Har Adar. He said he saw the Palestinian workers sitting there when he went to buy milk, on the morning of the attack. I wondered if they had rounded them up for their own safety, I said. That was after I saw the venom spewed forth on our private community Facebook page. The fury began on Facebook that same day. They’re all terrorists, wrote some. Don’t let them in your house, said several others; if you do, you’re risking your life and the lives of your children. 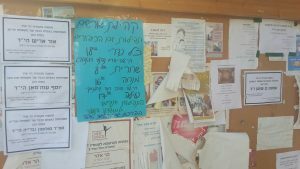 Betwixt and between, arrangements were discussed to visit the houses of mourning, one in Be’er Ya’akov down near Rishon LeTzion, one in our neighboring Muslim town of Abu Ghosh and one in our own Har Adar. A long, emotional post by one neighbor said that with such great gaps between them and us, despite seemingly warm personal ties for years between the murderer and people in whose homes he worked, despite the money they make working here, despite how fair and kind we believe we are to them, their frustration, fury and envy will find its expression in religious ideology, she wrote. 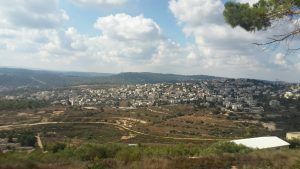 Our neighboring town of Abu Ghosh, which is Muslim, and is also the biblical site of Kiryat Yearim where the Ark once rested. And then she went too far, for people who had lost loved ones and friends here that day. She wrote that all the deaths where tragedies, even one not usually counted in such attacks. The responses grew furious at that. You’re insane. You disgust me. You’re sewage. You’re filth. Etcetera. Out of about 77 replies to her comment at that point, I only saw two that showed understanding of her viewpoint. I wondered about that, given what I know of our community. Apparently so did one neighbor who went as far as to post, in response to those posts, the official distribution of Knesset votes in our community, which is a West Bank settlement just over the pre-1967 line – 47. 77 percent of our votes went to center-left or left-wing parties. And the posts continued to pour in. The woman with too much sympathy eventually retracted her post, with apologies. Our community rabbi also posted on our community Facebook page. Ah, he’ll have an answer for me, I thought. OK, Let’s see now. He quoted from Psalm 130, the one that begins, famously: “Out of the depths I called Thee O Lord.” One I’m sure families and people of faith are reading these days, especially across the United States. The verses he quoted were 6–8: “My soul waiteth for the Lord, more than the watchmen for the morning; yea, more than the watchmen for the morning. O Israel, hope is in the Lord; for with the Lord there is mercy, and with Him is plenteous redemption. And He will redeem Israel from all his iniquities.” I can relate to that, I thought, noting how poetic that the verse the rabbi found was about watchmen. What do you think of that, I asked my husband Arik, who, not by the way, is a wounded warrior who this Yom Kippur marks 44 years as a paraplegic. That puts it on God, he said in his usual cryptic manner. At Kol Nidre services, in the women’s section, I told a neighbor I had come because I was hoping to hear the rabbi speak out about the need for unity in the face of the disaster that had struck the families of the fallen and the community. Indeed, his sermon began with the same verse he had quoted in his post: “Waiting for redemption ‘like the guards wait for the morning’. That’s something almost everyone here can relate to, he said. “Who here hasn’t done guard duty at night and waited for the morning, for the shift to be over, giving thanks for having stayed awake,” he continued. But when morning came for Solomon Gavriyah, Youssef Othman and Or Arish, the rabbi reminded us, it was their last. He spoke of their heroism and camaraderie, of the light they brought to the world. He spoke of his personal acquaintance with Or and Youssef, and the heroism of Solomon and his family, who had come to Israel from Ethiopia. He didn’t counsel us as to what we should do now. Perhaps he wanted to leave it up to each of us to know what’s right. Perhaps he wants us to realize that we should trust in God, like the Psalm says. Forgiveness for “all the people”…I’m not that noble. I can’t find any forgiveness for the perpetrator. I haven’t even forgiven the neighbor down our street, who in his carelessness rammed his car into Arik’s car three and a half years ago, seriously injuring Arik and his mom, who never fully recovered (Arik’s mom died last month). But I’ve got a new vow. It’s one I don’t intend to seek release from next year on Yom Kippur. It’s an anti-venom vow. I vow to speak out when an entire group is incriminated and condemned for the actions of damnable individuals. I vow to continue to see every person as just that: a person, not a threat, not part of a nameless, fearsome mob of others. I vow to hold on to what makes me a member, above and beyond any other group, of the human race. Further reading about Har Adar: My Judean Mountains Home. Miriam Feinberg Vamosh is the author of several non-fiction books about daily life in Bible days and a historical novel, The Scroll. Miriam, sensitive, moving, insightful, G-d honoring… I share your heart. Thank you. I know you do, Terry. Thank you so much for your warm words. Thank you so much, Kiki. I vow to vow your vow!! Powerful and sensitive!! Love trumps hate and we will continue to learn that and work on it every day. Your words are so beautiful.